I like making banana cake. They're quite easy to make. More importantly, they're delicious, especially when eaten while drinking a cup of tea. 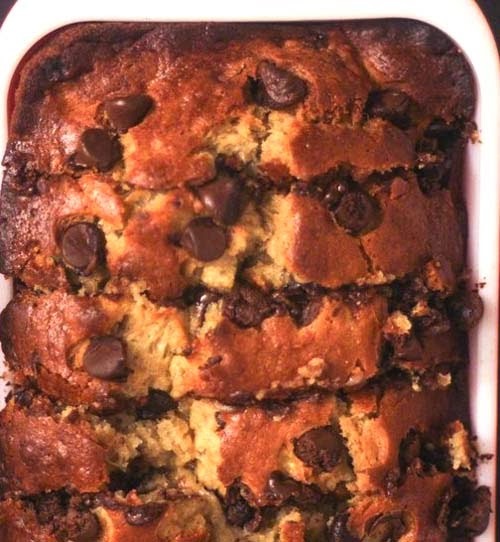 When made with chocolate chips, banana breads (or cake if you prefer to call them) become utterly delightful. Here's a simple recipe to make one. Prepare a 9x5 inch loaf pan by greasing lightly. Combine flour, baking soda and salt in a bowl. In a separate bowl, mix together butter and brown sugar. Stir in eggs, mashed bananas, and chocolate chips until well blended. You might want to save some chocolate chips to put on top (or just grab a handful more from the bag and put those on top). Combine the banana mixture and flour mixture. Stir just enough to moisten. Pour batter into prepared loaf pan. Sprinkle some more chocolate chip on top to make it look more scrumptious than it will already be. Bake in oven for 60 minutes. A toothpick inserted into center of the loaf should come out clean when it's done. Let bread cool in pan for 10 minutes then pop it out and cool on a rack. Serve and enjoy for a delightful afternoon. 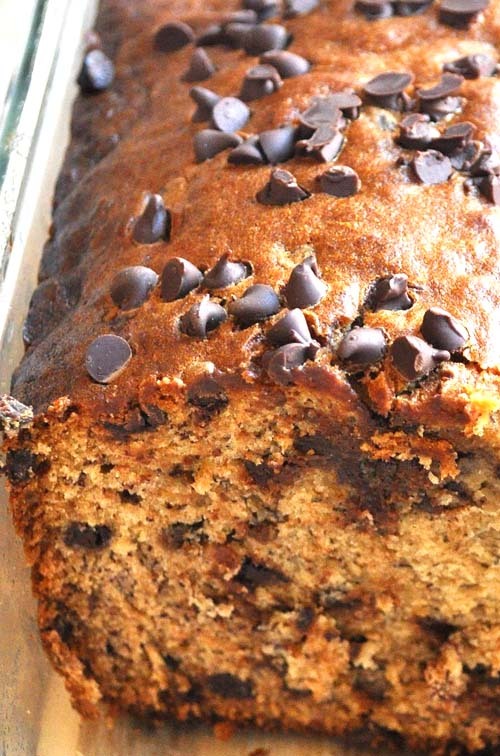 Here are some things to think about when making this wonderful banana chocolate chip bread. Many are looking for a banana bread recipe with oil. Well, as it turns out, you can substitute canola oil for butter. It's a common way of cooking light banana bread. Doing so should yield a healthier cake with less fat, sodium, and cholesterol. Also, 1 cup of chocolate chip may overpower the taste of banana, so use less than that amount if you prefer. As for me, I happen to like the taste of chocolate. Speaking of chocolate chips, I also use Hersheys chocolate chips because they tend to hold their shape better than other brands when baking. I know some who like to use organic chocolate chips.